Every time I spend a week to 10 days with my parents in their retirement community, I am struck by the gradual (and sometimes greater than gradual) diminishment I notice in many of the people who live there. I have known some of the residents a very long time, others just the dozen or so years that my parents have resided in the community’s independent living facilities, and still others less than the year since mom and dad relocated to a personal care apartment. On this trip my mother and I visited a friend who moved to the community’s dementia unit after her husband’s recent death. We chatted amicably with her until a woman who called herself a “lost child” wandered into the room. One of the hazards of living in that space, according to my mom’s friend, is uninvited guests who arrive with no idea of where they belong. I helped the lost one find an aide who settled her into the game room. Her eyes pleading for assistance, the lost woman repeated, “I don’t know you,” over and over again as I took her hand and led her down the hall. The many walkers and canes and wheelchairs on the premises remind me that mobility declines in old age, as do hearing and eyesight; accompanying these diminishments, of course, is less independence. By the time I leave the retirement community for the return trip home, I have become more aware of my own minor physical limitations, but I also notice that, in spite of their diminishments, these residents continue to carry on as best they can, though many with assistance of one variety or another. Some still play games together and attend concerts and worship services on campus, perhaps do their own laundry and ironing or walk the halls for exercise. My mother insists on stripping and remaking their bed weekly with my father’s help rather than allowing staff to do it for them. She has agreed to let others launder their sheets and towels, but she will not give up washing their clothing as long as she is able. I have not lived, for an extended period of time, near my mother since she gradually has become nearly blind with macular degeneration in the last number of years. The way she carries herself with a certain self-assurance and confidence continues to belie the difficulty she has seeing; those who do not know her condition likely will not notice in a casual exchange. But I am aware that my mother can no longer differentiate between the identical pairs of pants she wears, without a safety pin hinged to the “Sunday” pair. I know that she has given up writing in her daily diary because her magnifying headgear no longer enlarges her penmanship sufficiently. I observe that she now needs daddy’s assistance to pour their daily dose of apple cider vinegar. 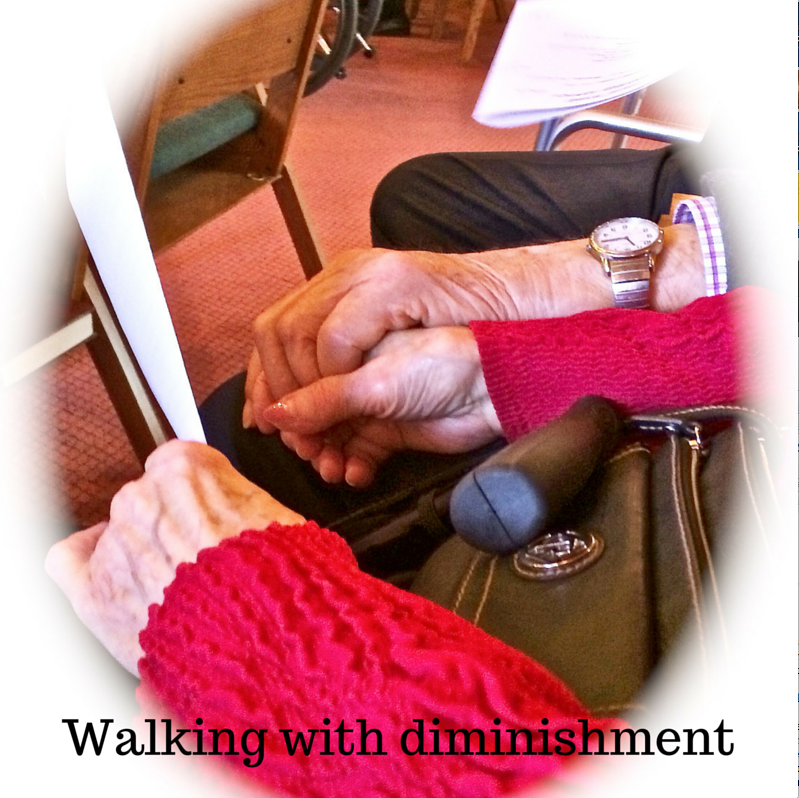 Mom and dad live with other kinds of diminishments, too. They have given up their car and pared down their belongings to fit a very small space. They have turned over management of finances to my brother and tax preparation to Jim. They eat every meal in the personal care dining hall, and staff persons bring their meds as often as needed. To accommodate mom and dad, I take responsibility to speak clearly and loudly as necessary, to clasp and unclasp mom’s jewelry, to be an extension of their eyes and ears, to speak on their behalf with staff, to walk at their pace, to run errands and replenish supplies. My frequent trips to their retirement community give me opportunity to listen well when I am approached by residents in the halls. More than once I have heard sad stories from those who have no one else to tell. I am impressed by the three husbands I watch feed their invalid wives several times a day, wives who can no longer interact in any way except to take in nourishment silently, spoonful by spoonful. By now I have stayed often enough and long enough in the community to know that, even with diminishment, some of the residents continue to cross-country ski, cane chairs, teach Bible studies, lead worship, push other residents’ wheelchairs (which my parents did until about a year ago), sing in choirs and display their art in local shows, cashier in the gift shop, visit with and shop for those who can no longer get out and about easily. While physical diminishment or loss may not yet be the companion of most of us at KRMC, all of us likely have confronted some sort of decline or depletion which asks us to adjust to changes we do not welcome. How might we travel the Lenten journey in a meaningful way with these impoverishments? How can we take better notice of those around us engaged in the stuff of decline and diminishment, whatever variety it may be? What green shoots of redemption do we notice in the midst of diminishments? to let the power of our faith story take hold of us.